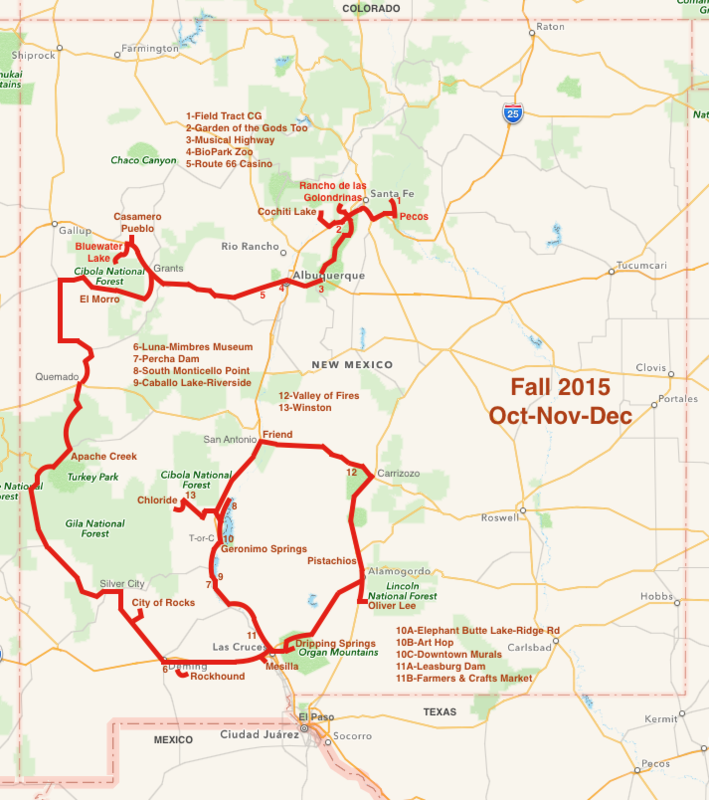 During the Fall of 2015, I did more exploring in the Land of Enchantment. Moving around slowed down considerably. However, I did get to see and do some new things. Camped in some familiar places and also some new to me. Visited the Pecos National Historic Park, experienced life on an early ranch at Rancho de las Golondrinas. Saw Inscription Rock at El Morro, and the Casamero Pueblo. The Luna-Mimbres was an amazing museum in Deming, saw the early Spanish settlement of Old Mesilla, and went to Geronimo Springs Museum. Hiked up to see Dripping Springs, the Oliver Lee Ranch, and Eagle Ranch Pistachio Groves. Checked out the ghost towns of Chloride and Winston. Attended Art Hop with friends, strolled around Truth or Consequences to see the Downtown Murals, and visited the Farmers and Crafts Market in Las Cruces. I bounced back and forth between camps near Elephant Butte and Caballo Lakes, meeting with old and new friends. Spent some time just relaxing, thinking about what I would do next or where I might venture in the new year.